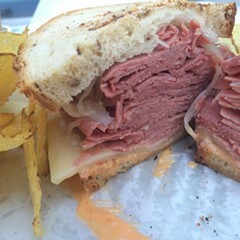 An ersatz old-timey sandwich shop in the West Loop slings made-to-order Reubens and more. Cash only. 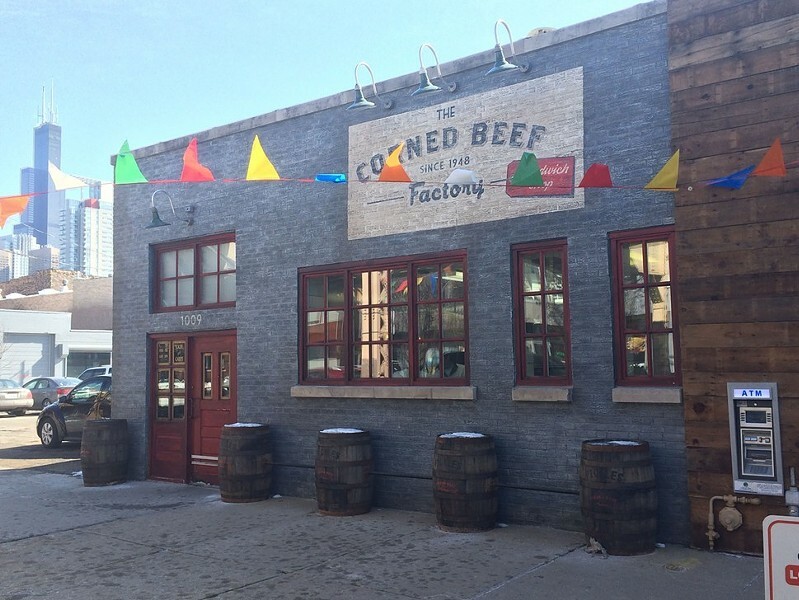 Open since January in the old Ex-Cel Corned Beef space, the Corned Beef Factory replaces the former's drab industrial feel with an ersatz Disneyesque likeness of an old-timey sandwich shop. The minimal, hand-scrawled menu—which features just a corned beef sandwich, a pastrami sandwich, a Reuben, Italian beef, and a hot dog—seems promising. Plus there's a chipper that cranks out fresh potato chips. 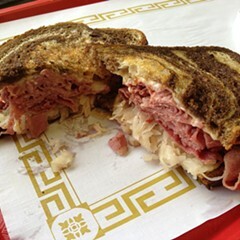 The Reuben is a mountain of meat between two slices of rye, but it comes up short in the same way Manny's corned beef does: it's steamed out and dry. Maybe it was a function of my arrival late in the day, or maybe they slice it too thin, or maybe they're using particularly lean brisket—or maybe it's a combination of all three. Whatever the deal was, this particular $11 sandwich was a letdown, in no small part because the cheese remained unmelted, and there were too few scraps of kraut on top and way too much Thousand Island on the bottom. At least the folks at CBF are accommodating: they've started selling those uncooked briskets over the counter like Ex-Cel used to. I've never had a problem with one of those.